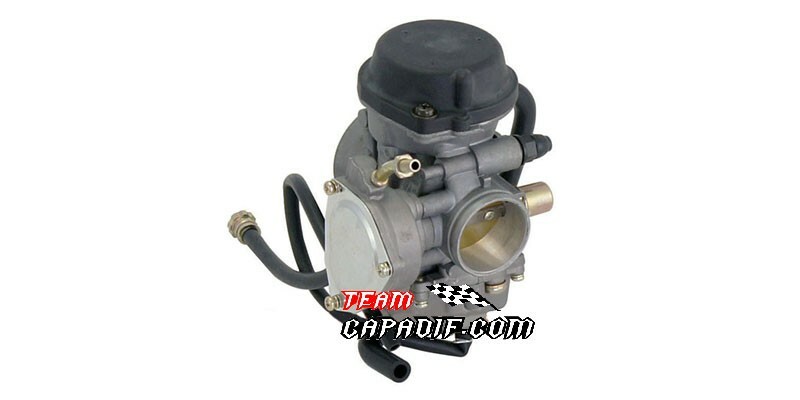 36mm Carburetor commonly used for a wide range of displacement in the 300cc, 400cc, 500cc, 600cc, 700cc, and 800cc range. 36mm Carburetor commonly used for a wide range of displacement in the 300cc, 400cc, 500cc, 600cc, 700cc, and 800cc range. This carb has a 36mm manifold opening, 55mm breather opening. This carburetor is made in Kunfu and is knows as 'the best' carburetor for these high displacement machines without close competitors. Very commonly used by brands like CF Moto, Chrinoex, Xinyang, Odes and many others. Specifically used by: Chironex Spartan 500cc and 600cc UTVs (4x4/2x4 and similar variations), CF Moto 500cc and 600cc ATVs and UTVs (4x4/2x4 and similar variations), Xinyang 500cc and 600cc ATVs and UTVs (4x4/2x4 and similar variations). Common Chironex model name is primarily listed as "Chironex 500cc Spartan XUV or UTV" and "Chironex 600cc Spartan XUV or UTV", Common listed Chironex Spartan Carburetor part number is 44520-5000. Common CF Moto model names consist of variations of "CF Moto 500cc or 600cc ATV", "CF Moto 500cc or 600cc UTV", "CF Moto 500cc or 600cc XUV", "CF moto 500cc or 600cc 4x4" etc. Common Xinyang model names consist of variations of "XY500UE","XY600UE" as well as a range of less formal names such as "Xinyang 500cc or 600cc UTV", "Xinyang 500cc or 600cc XUV", "Xinyang 500cc or 600cc ATV", "Xinyang 500cc or 600cc 4x4/2x4" etc. Common listed Xinyang brand carburetor for both the XY500UE and XY600UE is 44520-5000.